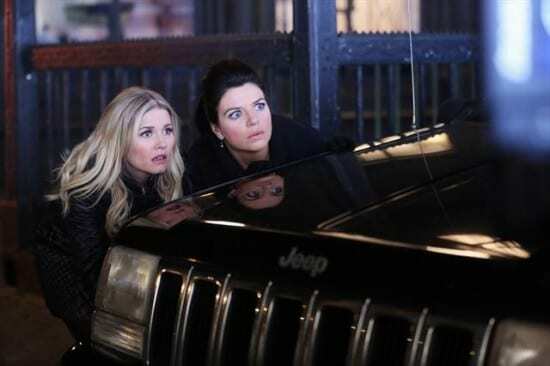 Alex (Elisha Cuthbert) and Penny (Casey Wilson) watch a pop star’s breakdown. Personal anecdote time: a couple of years ago, jokingly with a friend, we came up with the idea of an all-girl band names the “Ginger Snaps.” Why? Because we were red heads of course. I found it wicked clever and still reference the title no matter how stale it has gotten and how often people have heard the term. Let’s just say, that hearing “Ginger Snaps” now being used in reference to a gay bar that Max goes to just about made my night. Happy Endings is its own entity, wandering among all the other primetime television shows and enjoys wading it its own absurdity; it’s how the show excels. This week, Max was searching for his gay identity, Penny and Alex were the masterminds behind a pop star’s public breakdown and Dave and Brad tried to prove their manhood by fixing a dimmer. It’s all silly and absolutely ridiculous and yet the oddly placed storylines and the mundane problems that become incentives for the cast of characters to move along with their narrative’s work. For a show that after Sunday’s ratings, is solidifying itself as a goner it’s showcasing its true potential. Tonight’s episode was nearly without fault and kept me laughing. First off, there’s an actual continuity with Max’s storyline. Second, it was hysterical throughout and sometimes all an audience needs from a show that is designed that keeps you laughing, a thirty minute escape from the day. Brad and Dave proved for the second time this week that this show excels at cast chemistry as they shuffle the characters again. Their storyline begins when Jane, on her way to work, asks Brad to call the guy to fix the dimmer. This apparently threatens Brad as a man because as he says, he shouldn’t be the guy calling the guy, he should be the guy who gets called. Dave tells him that he’s quite handy with construction and tools and will be able to help him and that way they can prove just how overflowing with testosterone they are. This equates to wearing construction hard hats, hooting and hollering weak cat calls at Jane as she walks by them in the kitchen, and meticulously placing a well-painted hand on their jeans to give them the worn look. Their plight is pointless as they stare in front of the dimmer, lost as to how to even begin. They talk a lot, have fun doing pointless tasks but once they finally reach where the actual dimmer is, they accidentally blow the circuit. The squeal that Damon Wayans Jr. lets out followed by the cough and more “manly” noise is quite possibly some of the best work he’s done on the show. It’s yet another excuse to put two characters together and see how it plays out and it does so wonderfully. Dave is back to being the straight man character compared to Brad, but only by a hair. Zachary Knighton in one week has gotten better material than he has in a season worth of episodes. Again to reiterate, he is a funny actor who uses his simpering antics as a way to make his character grating (and let’s be honest, every character on this show can be grating) and these past two episodes have been a showcase. He’s quietly hilarious because Dave is such a dud and he plays it straight-faced, because while the audience knows just how much of a wet blanket Dave is, Dave thinks he’s the coolest guy around. This goes well with Brad’s characteristics of being seen as cooler than he is, all of which is an act to cover some of his more questionable tastes. Speaking of annoying characters, Penny and Alex are in top form this week. Penny has always been the character that toes the line of what is annoying and funny to watch, and what is flat out irritating. They came very close to the latter this episode but just managed to salvage it. When a pop star buys a piece of clothing from Alex’s boutique, Penny comes up with the idea call the paparazzi to get photographs of her in the dress and gain some publicity for the store. This idea goes south though when the young pop star has a breakdown after her date leaves her and she screams at the paparazzi and climbs atop of a car. It does, however, bring in the wanted publicity. They begin selling shirts that capitalize on the breakdown and it’s working until the girl in question walks into the store to accuse them. It’s here that the storyline could have felt convoluted, but instead the show again plays it with a strange mix of insincerity and humor. The two apologize to the girl admitting that they were a little too greedy and that she—like her lyrics suggest—really is only looking for extraordinary love as an ordinary girl. Hasty to label herself as the same as a pop star, Penny says that she’ll distract the paparazzi as she makes her getaway, and in doing so, runs headfirst into a car, adding another tally to the number of times she’s hit her head. It also just so happens that in the space and time allowed they’ve managed to call back the pop star’s date from the unfortunate night and set the two of them up on a date in Dave’s steak truck. What has Max been doing throughout all of this? Being awesome that’s what. In all honesty it is truly the highlight of a strong episode. Adam Pally has been on an absolute roll these past two episodes. He’s managed to subdue Max a bit, play on the idea that’s mildly depressed after being alone romantically for so long, yet all the while playing up just how weird Max can be (him about to shave with yogurt comes to mind). This proves to supply a wonderful montage which includes the aforementioned “Ginger Snaps” (yes), the Ostrich groups, the Wall Flowers and more. It’s hilarious; it’s even a little touching to see the usual overconfident Max wandering around not quite knowing his place. I can’t help but wonder if it’s a subtle nod to those who talk about how Max isn’t quite like other LGBTQ characters on television because of the fact that his most defining characteristic isn’t that he’s gay. His storylines very seldom focus on his sexuality; it’s simply an aspect of his personality. Sure, he’s a gay character but his character has also been painted as one who’s a slob, kind of mean-spirited but insecure about his body, is an avid lover of John Hughes films and someone who seems to draw in the same type of weird personalities as his own. He is a big thing for the LGBTQ representation on television because he’s one of the few on primetime that isn’t labeled by his sexuality (the gay character), nor is he painted as the joke or the victim. He’s an actual character with traits that subvert the sexuality aspect and that’s huge. Which makes it all the better that the storyline this week focused on him finding his niche and it turned out to be one that’s super specific and totally Max. This episode was fantastic and a reminder to why fans rally around this show as well as they can. It’s never going to have the popularity of other Tuesday night shows such as New Girl (another great comedy) and that’s always going to have its pitfalls as I’ve stated before. But it has once again seamlessly strung together an episode that in the hands of any other showrunner could have very well been a disaster. But showrunner David Caspe has faith in his writers, in his characters and most importantly his actors to bring his material which is funny on its own and elevate it to its highest potential. What this show has never been is a missed opportunity; it takes every chance it gets to be something new and different and a little offbeat and runs with it. It’s refreshing to see a show take chances and not be self-congratulatory (I’m looking at you Ryan Murphy). Instead they do what they must to create a well-written show that plays to a certain audience who will appreciate the jokes and the humor and fall in love with this characters who are so absolutely ridiculous and yet so enjoyable to watch. Episode nine is done, ten and eleven is next week, and this season will end quicker than fans would like, but at least it’s going out strong. This was the first episode this season to truly emulate the feeling of season two and hopefully that will be an occurring theme. I just love this show so much. Even the episodes that aren’t that great are still pretty amazing. This episode wasn’t my favorite, but I loved all the stuff with Max and Jane. Max is one of my all-time favorite television characters. I hope this show will be on a good long time after this season ends. I usually have plans with a couple of my DISH co-workers on Tuesday nights, so I’m not usually home to watch Happy Endings live anymore. My DISH Hopper is always set up to record it for me, though, because I have the PrimeTime Anytime feature turned on. I love how everything on all four major networks during the primetime hours gets recorded for me automatically every night.